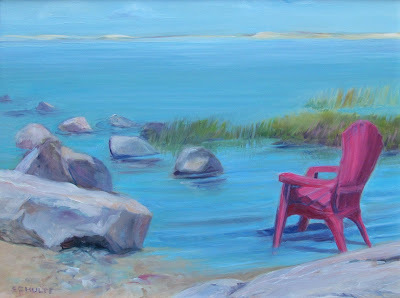 When my friend Mia and I went to Cape Cod to paint, we both found it very difficult to get started at our first stop to paint at Gray's Beach. It was too sunny and hot; I couldn’t set up the easel with the umbrella because the wind would blow it away. I set up the chair and then realized that the tide was coming in too fast to do the painting that way. Then I moved the chair and tried again, but the rocks kept getting covered with too much water. And my feet hurt, and I felt all discombobulated. So I did the best I could and when we quit, was delighted to find a lunch place with air conditioning. Later in the studio, I reworked the painting and combined three different images. What made it work was more rocks, bigger rocks, and water coming right under the chair. Each time I start a painting series, I have incredible barriers to overcome. This trip was no exception. There’s that lesson from Mom again – where there’s a will there’s a way……..and my own translations: just keep on keeping on, and put one foot in front of the other…….eventually you will make it. Thanks Mom, again, for this lesson. I'm from New England and read your comment with nostalgia! I find, however, when I take fotos and then paint in my studio from the fotos, thatI tend to copy the photos carefully. Is that "as truthful" as paintings done in "pleine aire"? I was always told not to copy fotos. How do you get inspired art that way? Maybe I have to try to develop more immagination? This is a wonderful question, one I struggled with for years. and because my answer got so long, I am sending it out as my next post! I don't paint but I do like to photograph places and moments I want to remember. In the best of these, there is a quality that evokes a memory. A moment in time, the slant of the sun, a feeling of wonder and gratitude for being there. Could a photo be used as a reference a passport to journey back in memory to recapture the experience of the witness? I'm guessing like singing there must be a degree of interpretation between the artist and the event. I have always seen my creating art as a conversation between me, my paintbrush and whatever I am painting (usually something from nature). When the connection stops, the painting starts to die and I have to say to myself stop! NOW!